It's a valid question, what exactly makes Dragunov, Dragunov? 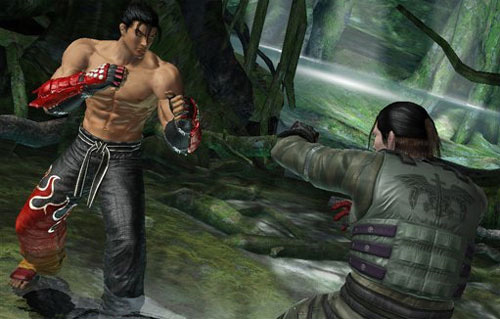 If you have played Dragunov before, you might have noticed that he really doesn't fall under the standard canon of a Tekken character. Dragunov has no hopkick, no generic running 3, no generic d/f+2, he no longer has a generic launching 4 (aka magic 4), and no NC KND string until i15. So if this is your first time playing a character, for example, other than Law, Paul, or Feng, you're in for a surprise. Inversely it's possible that you're sick of "generic" characters (not trying to use it as a pejorative) and are ready to try something entirely different, thereby Dragunov is a pretty good example of that. There's certain classifications (of size) in which characters can fall, namely: small, normal, tall, and big. There's also a sub-category of normal/tall that characters can fall into (i.e. King, AK) which is the most notable, of sub-classes, but not relevant at this time. A character's height/size usually determines positive characteristics, such as reach, as well as negative characteristics, such as being susceptible to more damaging combos. While Dragunov falls under the category of tall, his stance (in a neutral) state is actually quite compact. Unlike Miguel (who's also a tall) that stands at full height in his neutral state, Dragunov is hunched over indirectly hiding his height. That picture is a little hard to compare the two, regarding height, so let me show a better example. While unscientific, this is a fairly close representation to Dragunov's height versus Paul. The green bar represents the lowest position of the character's neutral stance, the red bar represents the highest position of the character's neutral stance, while the white bar represents approximately the average. A secondary 1px blue bar was added to the bottom of the white bar for comparison reasons. For Paul, I used where the back of his head as a representation of his approximate height, disregarding his hair as it's most likely not a part of his actual hitbox. For Dragunov I used the top of his head, disregarding the visual apex from the feed as it's most likely a video artifact, therefore (with regards to the stream) leaving about a 1px margin of error. Now it's possible that the idle/neutral animation is not a true representation of Dragunov's hitbox and instead remains constant through out, but I find it unlikely as there's a character like Mokujin that imitates other character's animations and attacks, but does not retain the actual hitbox and instead has his own. Therefore one can assert that the actual idle hitbox is as well a near 1:1 representation of the character, assuming that Mokujin's idle hitbox represents the character's, only smaller. Namco is pretty tight lipped about what makes their game tick so this is purely speculation, but it does lead to my next point. One would naturally assume that as a character gets larger their Sidestep (SS) and Backdash (BD) abilities would decrease almost linearly. For instance, Alisa is a small and has one of the best SS/BD in the game and inversely Jack is a big and has one of the worst SS/BD in the game. This trend is seen through out, e.g. Ling vs Marduk and Wang vs Panda, while the rest of the cast litters the rest of the spaces. Intuitively it makes sense, average size characters have average SS/BD. Therefore one could interpolate that Dragunov, being nearly a big would have almost the worst SS/BD in the game, but the data proves otherwise. Dragunov is about dead center on SS tier list and lower-mid of the BD tier list, more interesting is that Miguel is near the top of the BD tier list. So unlike big characters whose mobility is hindered by their size, tall characters simply aren't. Therefore the only negative effect of playing a tall is slightly increased combo potential for your opponent, but still not nearly as much as a big. On the other hand tall characters retain many of the benefits of playing a big such as long range/reach, long/fairly simple wall carry, and above average damage potential (save for Kuma).